In my quest to have a flowering Garlic Vine (Mansoa alliacea, Pachyptera alliacea, Bignonia alliacea, Cydista aequinoctialis), I experimented on various locations around the house. I've moved the vines until I found a location where they would flower. This article documents that journey. In late 2009, we already had seedlings of the Garlic Vine growing in small seedling bags in the garden. These were very easy to root from cuttings. They're hardy and grow quickly. They grew to about four feet but didn't yield flowers. This, in spite that they looked quite healthy. I've researched on the internet on its requirements for flowering. It seems though that there isn't much literature on the internet about it - at least compared to many other vines. 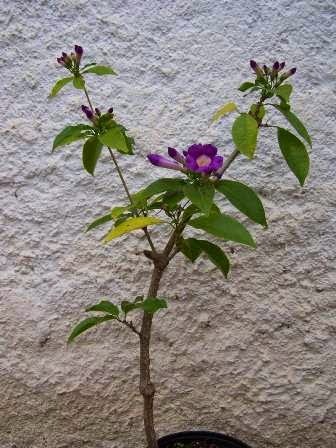 I found this rather odd because the Garlic Vine, also known commonly as Ajo Sacha, False garlic and Amethyst vine has remarkably beautiful flowers with a shade of purple. Is it because of its tropical origins and inability to do well in cold weather? Is it because of its garlicky smell considered as malodorous by others? At one mall, I found a small garlic vine like the one below. But the one I saw at the mall even had much thinner branches! At first, I couldn't believe that the garlic vine plant, though small, had flowers! I was so envious, that those who grew it were able to make it flower while my plants are yet to yield a single flower bud. I bought the mall plant and challenged myself. Here are two of my own garlic vines that I had replanted near our side fence. I even built a simple vertical wire support with an x-type pattern just for the garlic vines. This was in April 2010. Well a few months passed and my own garlic vines grew quickly. 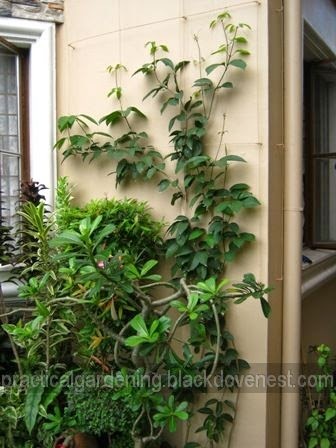 The Millionaire's vine or Princess vine or Curtain Ivy (Cissus sicyoides) was already growing on the horizontal vine support as shown below. This side fence faces north and had sunlight in the morning and afternoon - but only in the hot summers. It is shaded by the neighbor's house in the rainy season. The mall-bought plant just stayed in its own pot. After all, it had its own circular wire support that came with the plant's pot when we bought it. Not only that, it had flowered in its own pot and so I assumed it was in its sweet spot and would flower again. After almost a year, in MARCH 2011, the garlic vines had branches that were around a quarter-inch thick and the main trunk was half-inch thick. They've even risen above the Princess vine on the side fence. The Princess vine was giving plenty of shade to this fence. Still, the garlic vines had no flowers. Even worse, the mall-bought garlic vine stopped flowering also. I was clueless why it stopped. It reminded me of plants I bought that disappointed me. This is because after taking these bought plants home, the flowering just ceased. I kept pruning this particular garlic vine because it was getting too tall and was outgrowing its circular vine support. I was actually hoping for a compact flowering vine in this pot. Then in November 2011, I thought it was time to relocate them because they just weren't producing results - flowers. Again, I built a vertical wire support for vines. This time it was at the front wall of the house. This front wall faces the west and receives late afternoon sunlight. I removed the two garlic vines from the side wall and replanted them at the front wall. Here they are at the front wall of the house. Just to keep things interesting, I decided to relocate the mall-bought garlic vine in this same spot too and keep all three vines there. The tendrils of this vine has become a bit tough and woody that it was a bit difficult removing them from the circular wire support as shown below. See part 2 for the continuation of this article.